We’ve been busy around here soaking up the gorgeous Atlanta weather we’ve been blessed with this week. We’ve been hiking, biking, going on long walks, and hanging out on the back porch. It’s been a great way to spend my last week of fun-employment as well. I go back to work full-time on a new project Monday, and while I am excited to get back to work get a real paycheck again, I will miss living the life of leisure! Going back to work also got me thinking about getting back on a weekend meal plan and prep schedule. I was brainstorming ideas for dinners that make a lot and that I can freeze, or would make good leftovers for the week. While this recipe didn’t leave a whole lot of leftovers in my house, it’s easy enough that I can double next time I make it to stock up the freezer. This is one of my favorite recipes for homemade Italian meatballs and sauce. It’s a recipe that I picked up from a Rachel Ray magazine years ago. I have made a dozen times, and know the recipe by heart. This time around though I had to make a few substitutions to keep it friendly for our cave. Basically I had to sub out the breadcrumbs and not serve it with pasta. I found that making paleo breadcrumbs is super simple with some almond meal and a few spices. These homemade Italian meatballs and sauce are safe for anyone following a primal diet, you can also omit the cheese and make it full on paleo. I thankfully tolerate cheese just fine, so I added it in. When wondering what to label this recipe, I came across this article from Robb Wolf, that explained these different approaches to paleo. It can get confusing at times! The other awesome thing about this recipe is that is can all be made in one pot! One pot, one bowl, clean-up is easy as pie. The weather has been so nice we were able to light up the grill to grill some veggies to go along side with these homemade meatballs and sauce. Pair it with a big glass of red wine, and you’re all set for a great meal! Homemade Italian meatballs and sauce that are primal, gluten-free and can also be made paleo by omitting the cheese. Simple, quick, one-pot recipe. In a large bowl make your "breadcrumbs" by combining the almond meal, salt, pepper, garlic, parsley, onion and oregano. Pour in your ¼ cup of water to soak the "breadcrumbs" and set aside. In a large pot, or wide saucepan (I used my dutch oven) heat olive oil over medium heat and cook the 2 smashed garlic cloves until golden brown. Add in your 2 cans of tomatoes, season with salt, and let simmer over low heat, stirring occasionally, while you make the meatballs. To the bowl of breadcrumbs, add your meat, egg, minced garlic, cheese, salt and pepper, and combine. Roll 2 Tbsp of the meat mixture into a ball with your hands. Continue with remaining meatball mix until gone. Yields 18-20 meatballs. Carefully drop each meatball into the sauce, making sure they are submerged. Raise the heat to medium-low, cover and cook for 30 minutes without stirring. Serve with veggie noodles, grilled vegetables, as an appetizer, or pasta if that's your thing. 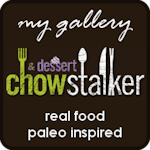 This entry was posted in recipes and tagged appetizers, beef, gluten free, Italian, meatballs, paleo, primal, recipes on February 21, 2014 by Adrienne. Anything I can substitute for the almond meal? Like coconut flour? I am not sure. I haven’t tried it with coconut flour, I would stick with a nut meal though if you can. If you do try it with coconut flour, I would use about half as much since it tends to soak up a lot of moisture, and let me know how it goes! I did end up trying it with coconut flour because I saw another recipe that used it. I didn’t see this until now though so I used the same amount of coconut flour as called for. They turned out pretty good, but a little on the dry side 🙂 So next time I will remember to use less! Thanks for the recipe!